As mothers and fetuses grow and change over nine months, many moms take the chance to re-evaluate some aspects of life, including the foods they eat and their exposures to unsafe chemicals. Beyond the typical advice pregnant women receive from their physician to stop smoking, reduce alcohol consumption, and eat a healthy and balanced diet, we recommend that women green their personal care product routine. A significant and growing body of research shows that pregnant women’s exposure to chemicals — particularly endocrine-disrupting compounds— can negatively affect normal development and may even increase their child’s risk for later life disease. Starting in the ninth week of pregnancy and continuing on to birth (otherwise known as the fetal stage), hormones direct the development of the reproductive and endocrine systems (which regulate metabolism and other aspects of development) of a baby. This is a very sensitive window of susceptibility, and it is important to make sure that both moms (and baby!) are extra careful to reduce and avoid exposure to possible endocrine disrupting compounds, reproductive and developmental toxicants, and carcinogens. Prenatal development is intimately tied with what the mother consumes. 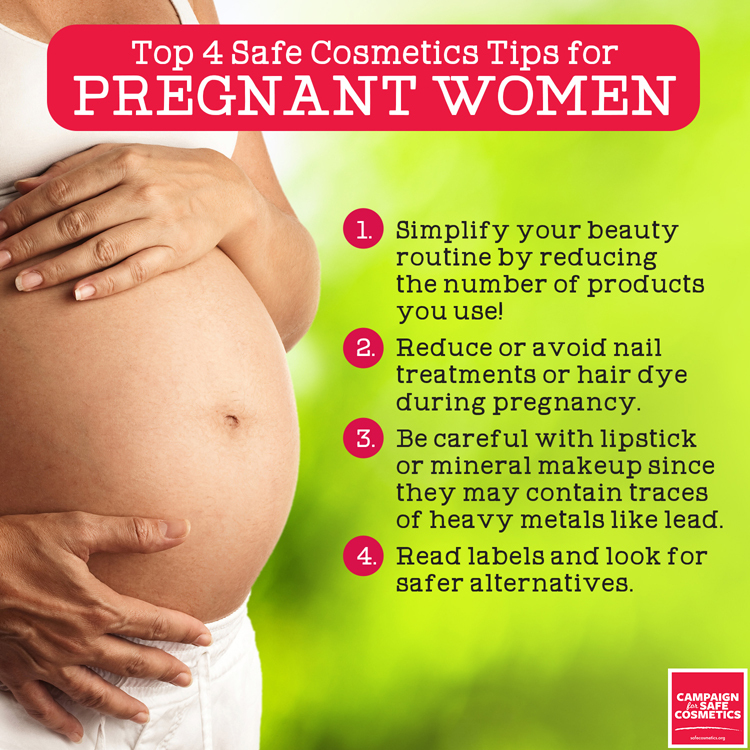 Similarly, personal care products and cosmetics may also reach a developing fetus, and it is important to look at what is in your makeup bag during pregnancy. Simplify your beauty routine by reducing the number of products you use! Reduce or avoid nail treatments or hair dye during pregnancy. Be careful with lipstick or mineral makeup since they may contain traces of heavy metals like lead. Read labels closely and find safer alternatives using tools like the Think Dirty app and GoodGuide.